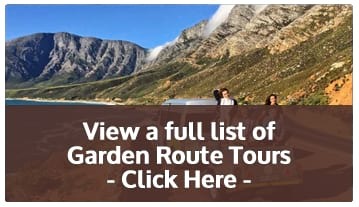 Moafrika Tours partners with Earthstompers Adventure Travel to offer guests 4 exciting days discovering the delights of The Garden Route in South Africa. It’s a visual feast of scenic wonder as you travel from the Western Cape to the Little Karoo along spectacular Route 62. Cape Town – Barrydale – Oudtshoorn (approx 422 kms/5 hours driving time). Depart from Cape Town/Stellenbosch early on Friday morning. Travel on the scenic Route 62 to Oudtshoorn in the Little Karoo which is known as the Ostrich Capital of the World. Enjoy a delicious lunch paired with splendid wine at a local winery. Afternoon spent on a guided adventure tour of the Cango Caves. Overnight in Oudtshoorn. After a delicious breakfast, your tour guide will drive you over the Robertson mountain pass to Mossel Bay. Spend some time at one of the many stunning beaches along The Garden Route, hike the Cape St Blaize trail along cliffs which overlook the Indian Ocean and visit the famous Diaz Museum Complex which commemorates the first-known European exploration that rounded the tip of Africa. The more adventurous can try a 10 000-foot tandem skydive or sandboard down the longest dune in South Africa. The afternoon is spent on a safari tour of a private game reserve which is home to lion, Cape buffalo, zebra and a host of antelope. Overnight in Mossel Bay with the option of several top-quality seaside restaurants for dinner. Your last day on tour of The Garden Route is spent in Wilderness National Park and canoeing down Touw River. After 40 minutes on the river, you are taken on a 2 kilometre walk along a boardwalk which takes one to a lovely waterfall and rock pools. Your tour guide drives you back to Cape Town/Stellenbosch at the end of the canoe adventure; arriving between 17h00 and 18h00 on Monday evening.